Many individuals classify a used Volkswagen Karmann Ghia as a "classic.” The Karmann Ghia combined the German automaker’s "Beetle" chassis and mechanicals with an Italian body style. This vehicle was available as a 2+2 coupe beginning in 1955 with a convertible being offered in 1957. Both body types disappeared from the new car market in 1974. Shortly after production began this Volkswagen offering became the car most imported to the United States. 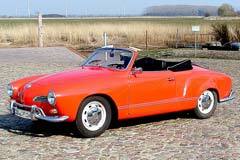 Subtle changes may be noticed on used Volkswagen Karmann Ghia's as the model years progressed. For example, in 1961 the front grille was wider than those of prior years and took on a "finned" versus flat façade. By 1970 the taillights grew in size. Integrated backup lights were added as well as a larger wrap around turn signal. In 1973, due to provisions by the National Highway Traffic Safety Administration, models imported to America where required to have stronger bumpers and the rear seat was replaced by a carpeted shelf. Used Volkswagen Karmann Ghia's have a reputation as being very solid, reliable vehicles. Additionally, with the mass shipping of these cars to the United States, replacement parts are easy to find. 1970 Karmann Ghia -- 1970 Volkswagen Karmann Ghia, Yellow with 5063 Miles available now!